Startup Stay connects entrepreneurs around the world with for business travel and networking. Imagine you've quit your steady job and put your entire life savings into launching your own startup. Money is tight, but pitching your product can rack up some hefty travel costs, hotel fees and food expenses. A new company called Startup Stay is trying to save entrepreneurs from a life on the road filled with instant ramen and sketchy youth hostels. The company gives startup founders a chance to save money by staying with other business owners while developing a network in a new city. The online platform allows its members to search by city to find hosts or arrange coffee meetings. It also lets users sign up to host travelers in their own homes. That model not only saves money for bootstrapped entrepreneurs, but also helps budding business owners network and learn more about the industry, said Fred Caballero, co-founder and CEO of Startup Stay. "We want to make sure that we spark new connections, friendships and collaborations as a result of entrepreneurs meeting face to face," Caballero said. "The value is in the unique network experiencing, being able to gain insight not only for your business but other businesses and the city you're traveling to." The London-based company operates on an application and invitation model -- it screens potential members to make sure they are sincerely interested in starting and running a business. Despite the strict standards, it has garnered a lot of interest: In its first nine weeks, Startup Stay registered about 3,000 members in 550 cities across 85 countries, Caballero said. Co-founders Caballero and Facundo Villaveiran started a Web agency together in Dublin in 2007, and they self-funded Startup Stay with some of what they earned through the other company. The co-founders were travelers of the world themselves, both having lived in Argentina, Spain and Ireland. But the duo came up with the idea after they saw Yammer messages from Latvian startups. 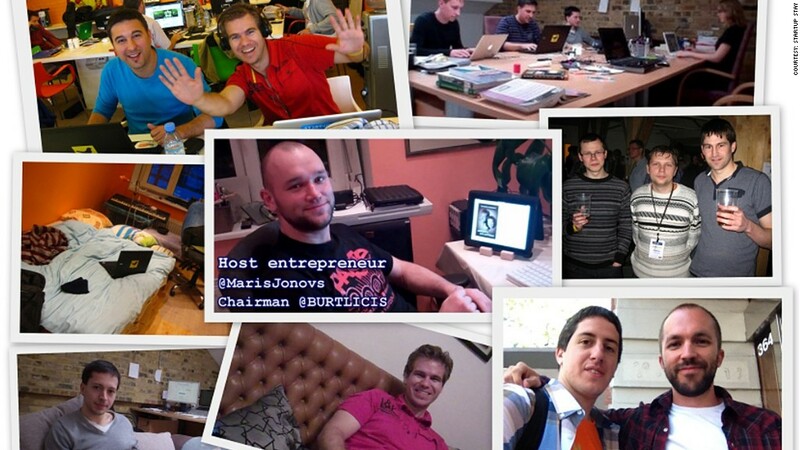 Eastern European entrepreneurs were looking for like-minded people to stay with while in London. Caballero said the pair thought that "there's got to be a way we can solve that problem for one person on a global scale." So they got feedback and played around with different ideas, before officially launching Startup Stay. Before launching the company, Caballero did a test run himself. The entrepreneur arranged to stay with hosts in Riga, Latvia and Buenos Aires, Argentina. Through those experiences, he was able to explore co-working spaces, network and even check out some local hot spots -- Caballero excitedly said he sampled Latvian beer with his host. Though the website is open to all kinds of entrepreneurs, Caballero said a majority -- 70% -- are in the tech industry. He hopes that in the coming months, more non-tech entrepreneurs will join, too.